Named one of the Top Ten talents to watch by the Vancouver Sun, Zachary Stevenson is an accomplished singer, songwriter, actor and multi-instrumentalist. With a BFA in theatre, Zach has been featured both as an actor and musician in major theatres and concert venues across North America from Victoria to Halifax, from the Queen Charlotte Islands to New York City. With 5 albums under his belt (three solo and two with Toronto's The Human Statues) he's been featured at the Ottawa Folk Fest, Blue Skies Festival, Summerfolk, Winterfolk (Toronto), Folk Alliance (Memphis), North East Regional Folk Alliance (New York) and the Ottawa Blues Festival sharing stages with the likes of Ron Sexsmith, Sarah Harmer, Danny Michel, the Good Lovelies and KISS. It's easy to go ape for the boss 50s sounds of Smashed Hits! Zachary Stevenson fires on all cylinders smashing your favourite hits by Buddy Holly, Hank Williams and Jerry Lee Lewis out of the park in a smokin' performance that'll razz your berries! 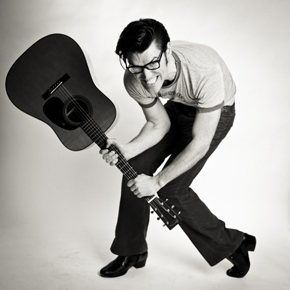 And the follow up, Smashed Hits Volume 2, is a tribute to Buddy Holly and contemporaries from the 50s Rock & Roll era. With the success of the first instalment he hit the studio to relive some of the old classics including Peggy Sue, Oh Boy and That's Alright Mama. The album was recorded at The Warehouse Studio in Gastown. "Stevenson can sing! The guy is a knockout." "Buddy's a blistering winner [...] feel-great, leaving its audience roaring for more! Zachary Stevenson nails the rock 'n roll legend in a full-throttle tribute that fires on all cylinders." "Zachary Stevenson is one of the most charming talents to grace local stages in ages." "We had Zachary and his band, Smashed Hits, perform at our Gala fundraiser in support of the Vancouver Hospice Society last Friday evening. Both he and the band were fabulous!!! The crowd of over 400 people were up dancing non-stop to the tunes of 'Buddy' and other 50's greats. What a hit! They helped put the "fun" in "fundraiser" for sure. Thanks so much, Zach."